A few days ago I was looking for a coffee mug for a set of kitchen art paintings I was working on. I wasn't real picky on the 'type' or shape of the coffee mug. A search in the Silhouette Online Store for 'coffee mug' brings up 124 different mug designs. Most of them are simply that - a mug. A single solitary image for .99. That's not a bad deal, but why not get more for your money? I started scrolling down and I found this set of four mugs for .99. I immediately knew this was the design I would purchase. On the right side of the image it notes that each design element can be used separately, as well. That means you're not just getting a coffee mug - or four coffee mugs, even. You're actually getting: a house, three different size hearts, a flower, a cupcake and two coffee mugs. That's actually 8 designs for .99 which is an even better deal. So while I know I'll be using the coffee mug immediately, I can also see myself using the cupcake to make a cute birthday garland or even a card. The flower is perfect for a greeting card and the house would be so cute for a housewarming gift card or craft. Once the image is un-grouped you will be able to select individual elements by clicking on them. Now you have the freedom to delete, move, and re-size everything individually. You can also select several elements - like the cup and the inner part of the handle - and regroup them so they stay together and proportional. Do this the same way as you un-grouped, but select 'group' instead. This is what I did so I could move the mug to the top of the cutting grid to enlarge it all at the same proportion. Tomorrow, I am going to show you kitchen art that I made with this design - and how I personalized it to really make it stand out. 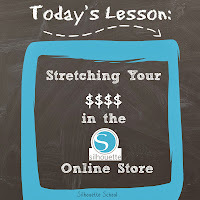 What tricks and tips do you have for stretching your money in the Silhouette Online Store? We'd love to hear from you - just share in the comment section below. Awesome tip! Thank you for starting this blog. Thanks @Carolyn. I'm glad you found us! What a great tip! As a new Cameo user, this will help me to decide on images going forward. I open the design store, select Designs, where it says SORT BY click the down arrow and chose LOW TO HIGH. Some times, like right now there are more than one free design. Also the next designs to show up are the ones on sale. ChaChing!! !